March 2019 was a good month. We went skiing for two days with Mrs. The Poor Swiss. Her ski lessons are going good. Other than that, we did not have any big event. From a financial point of view, it was a very good month as well. I received my bonus. This makes a large increase in our net worth. This is the first time I receive a bonus. I was more used to the thirteenth salary that is more the usage in Switzerland. Because of the bonus, we were able to save a lot of money this month. Unfortunately, we spent more than I would have wanted. Our goal is to spend less than 5000 CHF a month. We spent a bit too much on food this month. Mrs. The Poor Swiss also started a French course, which adds to the budget. But that is something that is not to be regretted! This post will tell you everything that happened to us and the blog in March 2019. This month, I received my yearly bonus. This is really adding a lot of money to my salary. This made our savings rate reach a new all-time high of 74.37%. This is really good. However, I was expecting to be able to reach 75% this month. Unfortunately, we spent too much. We did not reach our goal of staying under 5000 CHF. In total, we spent 5087 CHF. This still okay. But we can do better. One of the things that cost a lot this month is the beginning of a new French course for Mrs. The Poor Swiss. We paid about 600 CHF for the two-months course and books. This is only twice a week. This is a lot of money. But I think it will be entirely worth it in the long run. Mrs. The Poor Swiss was having motivation issues by working at home. We may even want to switch to some more intensive course if we find one. We took the Migros course. This was the most reasonably priced we were able to find. We are looking at other options for the future. For transportation, she is mainly going to take the bus. But I can drive her in the morning. For the bus, we went with a Half Fare card for 185 CHF. The stock market has been quite hesitating this month. It went up to a new recent high for the year. And then, it plunged a few percents. After that, it went up and down for a time. We will see in April who will win between the bears and the bulls. It seems for now that they are in a little standoff. But we have to wait to see the result. This month, I have done a lot for simplifying my home server infrastructure. I have dismounted two servers and sold all the pieces. In fact, I have been able to get about 700 CHF by selling them on the internet. This is more than I expected. I am pretty happy about that. And it is starting to save some space on my server rack. I am thinking of changing to a smaller one to save a lot of space and make it more practical. I have started to look for good second hand sales. However, while full racks are easy to come by, half racks are not that easy to find for a good price. Transportation: 974.05 CHF: Way higher than average. I had to prepare my car for the checkup which cost 200 CHF and pay for the checkup itself which is another 50 CHF. And I had to pay the yearly taxes for the car, 420. We also decided to take a half-fare card for Mrs. The Poor Swiss. Communications: 111.62: A bit higher than average. I had to renew two online service subscriptions. I am pondering whether I will renew again next year. But this is very little per year. Personal: 1164.40 CHF. Above average. There are the costs of the French course and its books. I also ordered new smart light bulbs for home. And we bought a new sofa, second-hand. Food: 551.40 CHF. Well above average. This is pretty bad! We went twice to the restaurant this month. And we paid the groceries for my entire family in Ski vacation. We also did Spring Rolls and Chinese dumplings this month. Apartment: 1496 CHF. Above average. This is expected since I pay the power bill only every three months. Taxes: 0 CHF. We are in between taxes. 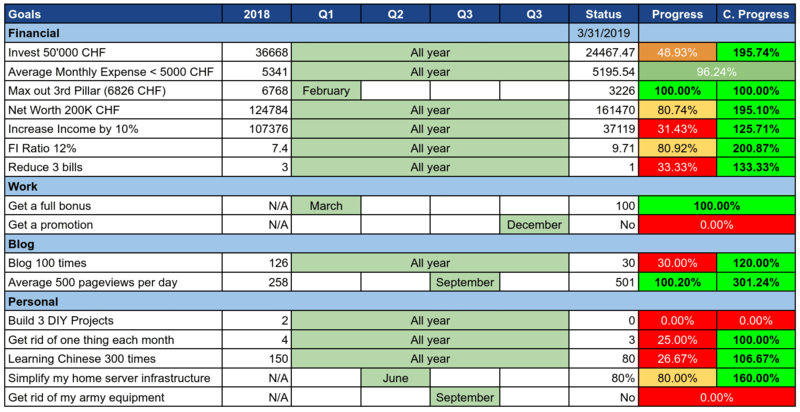 In March 2018, we spent 5087.52 CHF. This is really disappointing for me. I was really expecting to be able to stay under 5000 CHF this month. This is especially disheartening considering that we did not pay any taxes this month. This should have been one of our best months. I am going to put extra optimization effort next month. I was planning to start the gym again and buy a standing desk as according to our 2019 health plan. However, I will delay at least one of these expenses. We have to bring our average down for the year. I will look extra for some cheaper options for both. Our goals are in a really good place right now. We are already in advance for most of our goals. Some of them have been going twice faster than I thought. However, it is also due to the ESPP payout last month and the bonus this month. These two events together made it easy to grow our net worth and investments. The goal that is the worst is for our average expenses. Our average is still above 5000 CHF. As I already said, I will need to work on that next month. As for reducing three bills, I am in the process of reducing a second bill. But it takes more time than I expected. I have been able to fully invest in my third pillar. I used some of the extra cash from the transfer of broker to do this. Regardless of the broker change, I would have been able to do it with the cash from the bonus. Unfortunately, I have not been able to invest more since I have reached my transfer limit on my bank account. This is because I transferred a lot of money from DEGIRO to Interactive Brokers. I am still in the process of transferring my portfolio from one broker to the other. This month we also got rid of an old kitchen appliance. 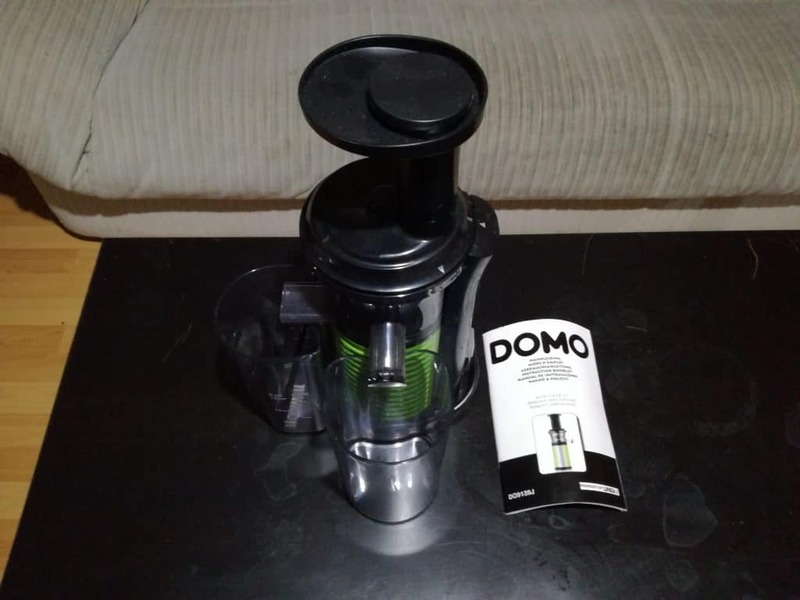 It is a very good juicing machine. However, I have only used this machine three times and we never used it since Mrs. The Poor Swiss arrived in Switzerland. Since it takes quite some space and we never use it, we decided to sell it. We got 20 CHF back from it. It is not a lot but this is much better than having something at home that takes space. Next month, I plan to do a big cleanup of our medicine closet. Thanks for my bonus, our net worth jumped to 161470 CHF this month! This is pretty great. The stock market did not help a lot this month. But this will come in due time. There are more and more talks of a recession. And the current market is still not out of correction territory. We will see what happens. I have not been able to finish the transfer of my portfolio. I am sitting on a big pile of cash waiting to be transferred to Interactive Brokers and invested. This will be done next month. March 2019 was a great month for the blog. After a very low traffic month in February, this feels great to start again with a very good month. The blog got 75% more traffic compared to last month! And it got 50% more than the record month of January 2019! I even reached my goal of 500 page views a day on average for the month. Some of this growth is coming from mentions. The guest post by Aiden White got republished on Rockstar Finance. And my series about learning money lessons from animated sitcoms was featured on The Sunday Best. And the marketing team of Selma did a very nice job promoting the interview with their CEO. On the other hand, I still got a very nice growth from organic search. This is really good. I will have to work hard to produce quality content next month in order to continue this growth. I will probably see a small decline. But I am going to continue improving the blog in order to rank better. I have many ideas for improvements! I also improved my social media strategy this month. For the first time, I have seen a real increase in traffic coming from Facebook. In fact, for the first month, it is in front of Twitter. However, social traffic remains a very little source of traffic for me. 45% of my traffic comes from Organic Search and 23% comes from Referrals. Since I had a lot of posts scheduled, I reverted back to my old schedule of three posts a week. It probably helped the traffic a lot. For now, I still have enough scheduled posts to continue to keep this schedule in April I think. Once I will start to get short on posts, I will see if I need to space them more. I am pretty sure this helped the growth a bit. But some of the posts that have a lot of views this month are from other months. So I am confident that my overall ranking is increasing. Revolut Credit Card – No more foreign exchange fees: This post is once again on the top three. It is not a recent one but it does well every month! Interview with Patrik Schär, CEO of Selma: This post did really well. It was really interesting to do the interview. And Selma’s team did a great job promoting the post! 5 Money Lessons from The Simpsons: I posted a new episode with the Simpsons. It did really well, probably thanks to a mention by Physician On FIRE. What was your favorite post this month? I do not see anything special happening in April 2019. It should be a very ordinary month. We are probably going to ski one last weekend if the weather permits it. We also have a few friends and family events scheduled. I really want to be extra careful next month about our expenses. We need to pay special attention. I do not want to reproduce this month high level of expenses. What about you? How was March 2019?